Wii has a new look. Wii titles with Nintendo Selects! see what comes in the box! Get your mitts on Wii mini and enjoy big fun for a mini price. Find out more at our official website! Wii mini offers big fun at a mini price! It comes packed with a red Wii Remote Plus controller & Nunchuk accessory. Plug it in and play! See what comes in the Wii mini box here. Nothing does motion-control gaming quite like Wii. Fun and intuitive gameplay enhanced by your own body's movements will get the entire family up and off the couch for unforgettable gaming sessions. 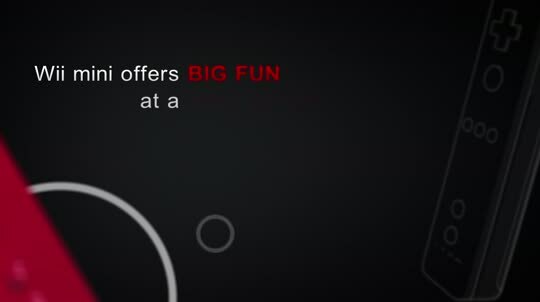 Click here to find out more about the fun that Wii mini offers. Catch up on some great gaming experiences. Wii mini is compatible with the huge catalogue of Wii games, encompassing top franchises from Mario to Zelda and Nintendo Selects too! There's never been a better time to catch up on some classic Wii titles! Nintendo Selects is a range of classic titles available at a great price, and includes blockbusters like Wii Sports Resort, Mario Party 8, Super Mario Galaxy and more! Get more details on the brilliant titles in this range at our Nintendo Selects page.